Chromium has been commonly applied as an acceptor-type dopant for TiO2. Its ionic radius (0.052 nm) is smaller than that of the host Ti4+ ion (0.068 nm). The incorporation of trivalent ions, such as Cr, into the Ti sites of the TiO2 lattice leads to the formation of acceptors. These result in reducing the concentration of electrons leading, ultimately, to the conversion of n-type TiO2 into p-type TiO2. • Antiseptic Coatings for Sanitary Areas. The antiseptic properties of TiO2 coatings are related to the light-induced bactericidal effect. The antiseptic coating can be applied in sanitary areas and hospitals. • Antifogging Coatings on Glasses. Antifogging activity is related to the superhydrophilicity of TiO2- coated surfaces. • Deodorizing Coatings. Deodorizing effects are related to the strong oxida­tion power of TiO2 leading to destruction of airborne organic compounds. The reproducibility of data requires that all the factors influencing the photocata­lytic process are well defined (standardized). 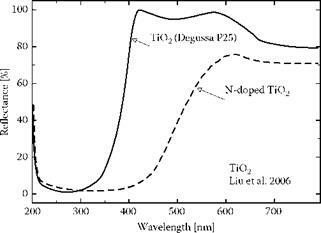 • Absence of both light and TiO2 (Figure 8.39a). In this case the bacteria have the tendency to multiply. 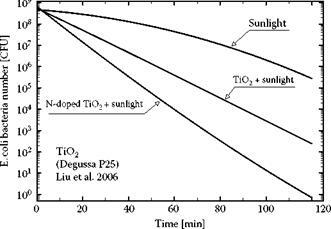 Doping of TiO2 with aliovalent ions is the current major research strategy in the development of high-performance photocatalysts. 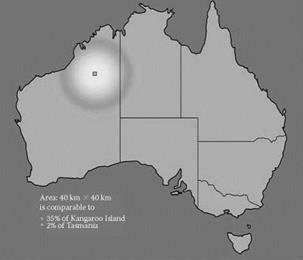 The aim is to increase absorption of sunlight by reduction of the band gap through the incorporation of aliovalent ions [8,9-11, 71,97]. A range of anions (nitrogen, fluorine, carbon) and cations has been applied for doping [98,99]. A substantial number of reports have been accumulated on the effect of noble metals, such as Pt, on the photocatalytic performance of TiO2 [81-92]. This data indicates that the photocatalytic activity depends on surface dispersion of Pt, forming small islets, and the related ratio of the Pt/TiO2 areas. Sakthvitel et al. reported photocatalytic oxidation of dichloroacetic acid at dif­ferent Pt load (the studies also included Au and Pd). The data reported by Sakthvitel et al. on the effect of Pt on photocatalytic properties is represented in Figure 8.33. As shown in Figure 8.34, the Pt-activated TiO2 catalysts exhibit optimum per­formance at 0.8 wt% of the Pt load. The primary photo-induced reaction at the cathodic site is the reduction of molecular oxy­gen (Figures 8.30 and 8.32) [83, 95-97]. The progress of the cathodic reaction depends on the supply of oxygen to cathodic sites. The concentration of electrons in n-type semi­conductors is relatively high. Consequently, the supply of oxygen to the cathodic site is critical for the performance of the photocatalyst . Enhanced oxygen supply may be achieved by passing a gas rich in oxygen through water (aeration). Alternatively, an enhanced oxygen supply may be achieved by adding an oxidant to water.